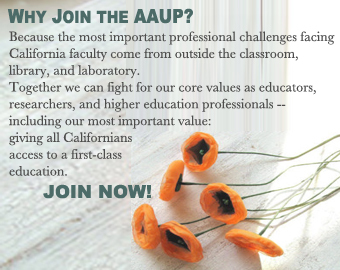 Consistent with the mission of the AAUP to safeguard academic freedom, to define values, standards, and best practices for the profession, and to ensure higher education's contribution to the common good, the California Conference of the AAUP (CA-AAUP) serves the interests of academic professionals and higher education at the state level. The CA-AAUP recognizes the profound value that is derived from having a membership drawn from all sectors of higher education--the community and junior colleges, the California State Universities, the Universities of California, religiously affiliated colleges and universities, and other private institutions; we view it as our task to articulate the interests of our various constituencies and to initiate, advance and coordinate actions to advance and protect those interests in California consistent with the principles and policies of the AAUP. The CA-AAUP promotes sound academic practices, for ALL segments of California higher education while working to ensure that such practices are accepted by the higher education community, state and national policy making bodies, and the general public. The CA-AAUP fulfills this role by: a) facilitating communication between local and national bodies; b) educating and influencing state legislators and policy making bodies; c) advising local faculty on governance, academic policy, and employment issues; and c) fostering public awareness of the significance and needs of the higher education community.